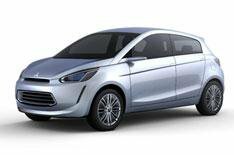 New Mitsubishi supermini revealed | What Car? Mitsubishi will unveil this new Global Concept Small supermini at the Geneva motor show this March. The car is expected to go into production in March 2012 and is a little smaller than the Colt it will replace. Even so, Mitsubishi claims the supermini will be able to seat five. Power will come from a 1.0- or 1.2-litre petrol, and Mitsubishi promises fuel economy of nearly 80mpg and emissions around 95g/km. The engines will be matched to a regenerative braking system and stop-start technology to improve efficiency, while the car's shape is designed to be as aerodynamic as possible. Reducing weight has also been a priority, and Mitsubishi says it has reduced resistance in the engine, transmission, brakes and tyres to boost efficiency.